Sometimes the food at the mall, it turns out, can be pretty remarkable, especially when that mall is in Flushing, Queens. Let me preface what comes next in this post by saying I never thought I would ever write about a mall food court. It’s just not something that ever crossed my mind, or even something I thought I would have considered. Then I went to the New World Mall in Flushing, a perfectly nondescript building that I would have easily walked by, had we not been on a mission to visit that very place. On a rainy day, we took the G to the 7 and rode it all the way to the end to Flushing. Nothing — no Mets game, no car body repairs, nothing — has ever brought me to Flushing before. I went to the U.S. Open once and pass through when I go to the airport. That’s it. 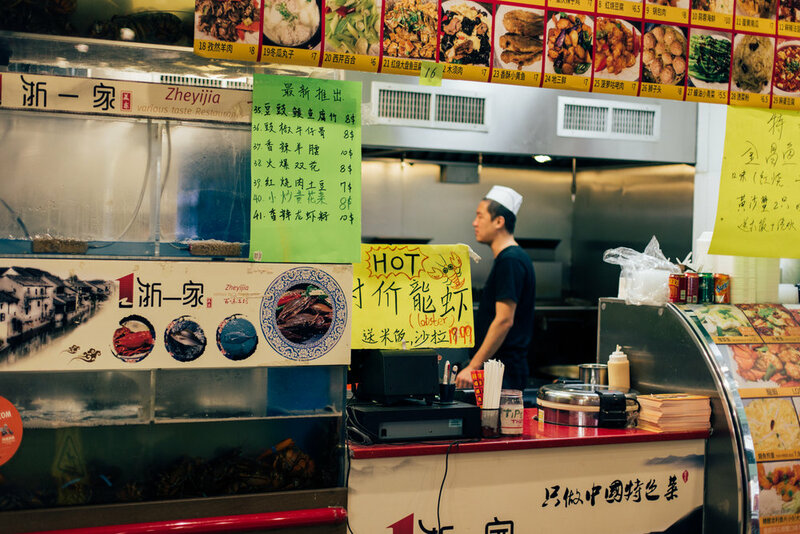 But there on the corner of Main and Roosevelt Avenue is a chaotic and thriving section of the city that has some of the most authentic Asian food in all the boroughs. We took refuge from the weather and descended into th the fluorescent-lit downstairs mall food court where we began to lap the vendors, checking out all the offerings. Dozens of restaurants there sell all varieties of Asian food, the likes of which I’ve never seen and could not begin to identify for you. There are of course the standards like Ramen soups and sushi and such, but there is also so much more. 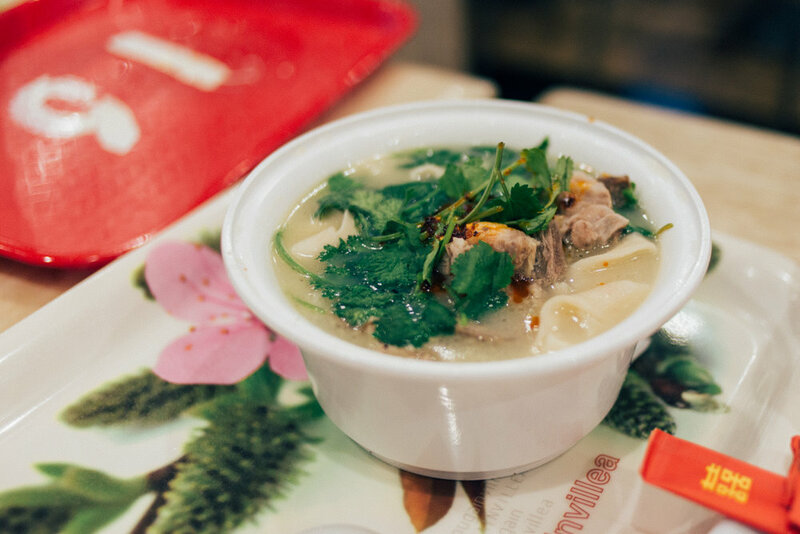 We went with dumplings (pork, shrimp, scallions), a lamb pho and a spicy fish soup, not all of which we intended to order, but that’s part of the experience. The hot fish soup was spicier than any I’ve had before, and the dumplings - made on the spot - were pretty much the definition of cold weather comfort food. Afterwards with full bellies, we hit Fang Gourmet Tea for a quick tea tasting where we had 10-year-old Tibetan brick tea, which I didn’t even know was a thing. It was pretty much the most relaxing perfect way to cap off a big meal and afterwards I felt the same calm as I do after meditating. 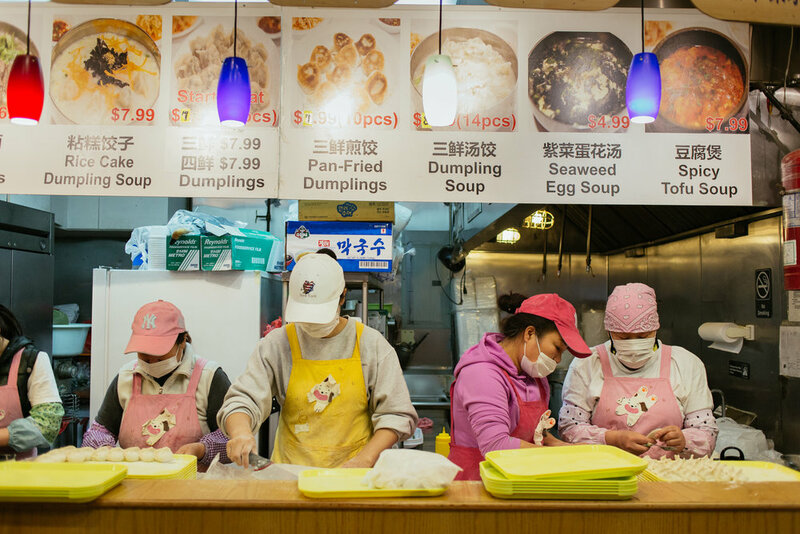 Not to sound to trite, but going on a food mission to Flushing really is an experience akin to traveling abroad, minus the airplane travel. All the food, even for a New Yorker, seems foreign and unique and new, and most importantly, so incredibly good.